Miller's Science Space: Kiwi Crate Love! So one of my teacher friends was looking for something to do for her sweet grandkids while they visited over the summer. 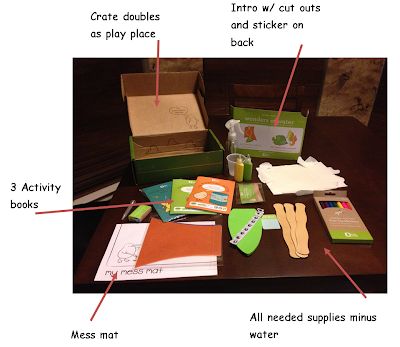 She found this website, Kiwi Crate, that sends you a box once a month of activities to do for kids 3-8ish. I thought, why not? My daughter (3 years) loves crafts, and most of these are science based. We are only 2 crates in, and we are having a blast! 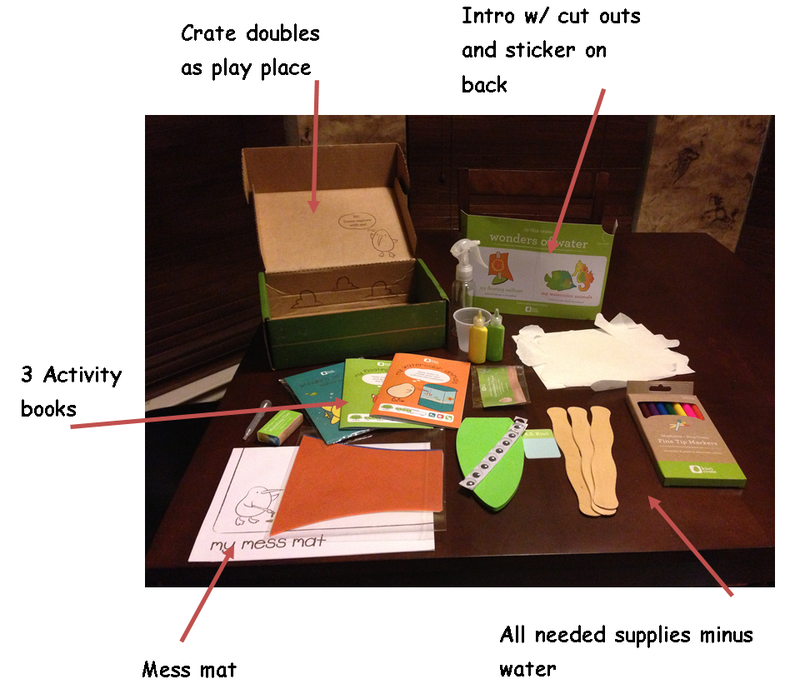 The crate comes with just about everything you need inside for 2-3 activities. This month was Wonders of Water. Each activity book has instructions on how to do the activity, plus ways to extend the craft you made, and links to more crafts you can do in the same category or with that activity you just did. This time, we get to make a sailboat (learning about force and wind power), make water colored animals (learning about mixing colors, and 2 science experiments, drops on a penny (surface tension) and clay boats (buoyancy). Each activity book has links to Kiwi's website for more on that topic. We do these one activity at a time. Day one is one activity book's basic craft. Then we extend it after we make it. Then stop. The next time we do something we go online and check out the extras for that activity book. When we finish those, we do another book. Each activity book can last us a week or more with the creating and extending. My daughter gets so excited about the science part (my little scientist!) that she has all sorts of questions and "esperiments" she wants to do for each one. Have more than one kid? They have add on packs of supplies for siblings. You get the crate, but it has double the consumables so each kid has plenty. Check out the crate at Kiwi Crate!